SPECIFIC FRD Weight Reduction Adult Cat Food is a dry food that's been specifically formulated to help cats lose weight. A diet low in fat and calories, but high in fibre and protein. This means you can feed your cat a large tasty amount of food, to satisfy their appetite, while still helping them to lose weight. Allows your cat to lose weight without feeling hungry. Low in calories and fat and high in fibre and protein – allowing you to feed your cat full portions. High in protein to maintain muscle mass. This increases weight loss as the loss then comes from fat rather than lean body mass. Contains added L carnitine – a fat burning amino acid. High levels of Omega 3 fish oils to help maintain healthy coat skin and joints. With starch for a slow glucose release and high level of fibres to slow down the release of glucose this diet is suitable for cats with diabetes. 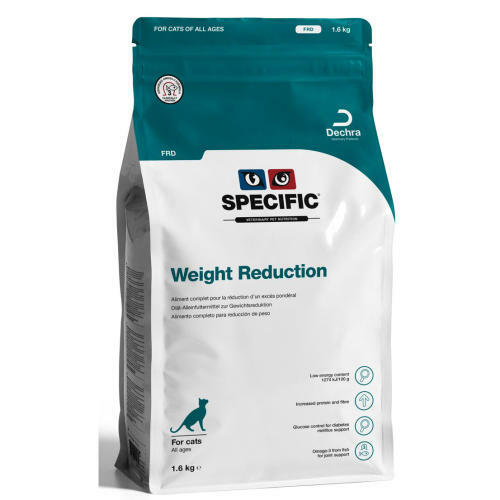 The high fibre content makes this diet suitable for cats with constipation. Maize protein, cellulose powder, fish meal, dried peas, wheat, oats, minerals (including tripotassium citrate), potato protein, animal protein hydrolysate, pork fat, maize, vitamins and trace elements (including chelated trace elements), methionine, ammonium chloride, fish oil, taurine, L-carnitine. With natural antioxidants (tocopherols, rosemary extract and vitamin C). Contains no added artificial colours or flavourings.